Corrugated Metal Steel Roofing Panels & Sheets Toronto (GTA) - Pro Roofing Inc.
Modern day corrugated metal roofing systems offer corrosion resistance, energy efficiency and provide economical roof solution for commercial, agricultural, industrial, and sometimes residential use. Corrugated roofing panels are usually made from thin gauge steel, usually a 24, or 26 gauge steel, which makes it economical and practical, when it comes to covering large areas of roofing surfaces. Corrugated metal roofs are more practical and longer lasting than asphalt shingle roofs, and they cost much less than standing seam metal roofing. Corrugated roof panels can be made from aluminum, galvanized steel (G-60, or G-90 steel), galvalume coated steel, and stainless steel. When going for a long lasting economical solution, galvalume steel provides an optimal combination of cost effectiveness and material longevity and reliability. When coated with a Kynar coating, corrugated metal roof can provide significant energy savings. Over the years corrugated steel roofing systems have benefited from many aesthetic and roof integrity system specific improvements, which now make it a considerable alternative to conventional asphalt shingle roofs that go into landfills after 15 years of service. Although metal roofing is more expensive than asphalt shingle, corrugated roof is quite affordable compared to standing seam. The corrugations are what make individual corrugated roofing sheets surprisingly strong. They are created using a process known as roll-forming. When this procedure is complete, the bending strength of corrugated metal roofing panels is much greater that they would be if the sheets remained flat. The increase in bending strength occurs in the direction of the corrugations, not across them. 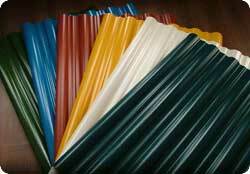 There are various different corrugations that can be applied to roofing sheets that will serve different purposes. Metal sheets usually have corrugations that are curved, giving the roof a wavy appearance. Parts of each sheet will overlap the ones next to them, with the corrugations fitting into each other neatly. Another commonly seen pattern in corrugated sheet metal roofing is the squared shape. This can be particularly useful in roof decking installations as the shape provides great support for the deck. The best roofing sheet choice for your individual property will really depend on its size, location and usage. Corrugated metal roofing sheets are a great choice for many buildings with their exceptional strength and low maintenance costs. Corrugations run in a straight line between the highest and lowest points, and at a right angle to the purlins (the intermediate supports). Sheets are laid so that the side overlaps are directed away from the prevailing wind. 8 mm diameter (min) hook bolts, crank bolts or coach screws, are be inserted through 10 mm diameter drilled holes. - NEVER PUNCHED - in the crown of the corrugations. Nuts or screws are be tightened lightly at first, and then tightened again when a dozen or more sheets have been laid. Arrived on time for the estimate. They went up on the roof and spend 20 min matching the interior to the exterior roof to find the problem. It turns out that it is the stucco interface which needed resealing. The estimate came to $350. One champ gave me $5000 to fully replace the roof, without ever bothering to get up there! Glad I found them. Showed up on time, completed the work as agreed. We've used Pro Roofing on two homes and are very satisfied with the work. They are courteous, quick, and clean up nicely after themselves. The staff goes out of their way to answer all your questions and prepare you for what to expect, and I think they left my yard looking nicer than it was when they started.